My Moroccan grandmother was an excellent baker, but I didn't realize until I was older that the dinners she prepared were quite basic, but tasty nonetheless. Cooking a lunch for 20-25 people on Shabbat was a big job, and she still managed to put together several different choices. In additon to a few tapas (carrots, peppers, and the mandatory challah), she prepared: salad with lemon juice and olive oil dressing; meatballs and potatoes (we soaked up the broth/oil with challah); chicken in a brown sauce, and; cous-cous with chickpeas that we ate with cinnamon and sugar. It wasn't until after my grandmother passed away that I ventured into a Moroccan restaurant and learned more about how those flavours can mix together. It was a Boujadi that I first tried a meatball tajine and I was blown away. There were familiar flavours and much more. Unfortunately, Boujadi no longer exists, but I'll always remember my first taste of Moroccan food that wasn't my grandmother's. Try Walima cafe at Danforth and Coxwell. Hi Dan - those meatballs look AMAZING! It's barely breakfast time here, and they've got me salivating and dreaming about dinner already. I definitely have to try this recipe. Thank you for sharing the story of your grandmother and the lunches she used to share - such occasions, even though they may be simply prepared, really shape our future palates I believe. 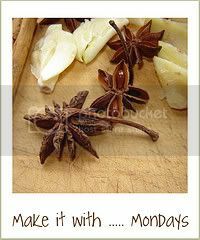 Thanks so much for sharing this at "Making it with ... Mondays" - challenge saffron.